As I’ve often complained here, my little corner of VT and NH suffers from a lack of good ethnic cuisine. One of the more obviously lacking cuisines is Thai. Our area basically doesn’t have many Thai restaurants, and the few we have are generally pretty dismal, so Thai food is one of those things we generally reserve for our trips to other places. But luckily, we don’t have to go all that far (in the grand scale of things) to find some good Thai. Siam Orchid in Concord is pretty decent (sadly, they used to have a location in Manchester as well). 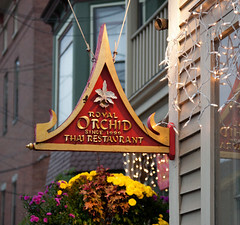 But another discovery of ours a few years ago was that a few blocks outside of Montpelier, VT likes another good Thai place, Royal Orchid. Nestled into a small converted house on Elm Street, unless you like taking the back roads into Montpelier you might never pass this place, since it’s several blocks off of the main retail downtown area. But up the the steps and through the old front door, and there are two large dining rooms serving up some fresh Thai food. And they’ve got a rather complete menu of Thai appetizers, beverages (I’ve always got a weakness for Thai iced tea), soups, and entrees. 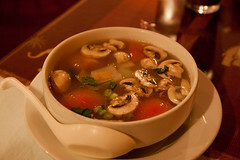 I’ll be honest about one thing about the food at Royal Orchid: to date, the soups have been nothing special: in fact, this time, my Tom Yum Gai soup was only borderline: the broth wasn’t particularly flavorful, liking the spicy and lemongrass notes I usually expect from a good Tom Yum soup. And more importantly, the mushrooms weren’t the usually straw mushrooms, but standard white sliced mushrooms, and a bit undercooked at that. I’d give the soup a 6/10. But when the entrees arrived, nearly all was forgotten. To start with, Carol had the Kao Soi, with chicken, noodles, coconut milk, and chili paste, garnished with pickled mustard greens and fried onions, topped with crisped egg noodles. Everything worked here: the sauce was rich and flavorful with nice notes reminiscent of a good masamun curry, the chicken was tender and flaky, the mustard greens tasty, and all the crispy noodle bits still crisp. 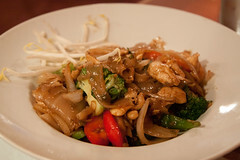 My Pad Kee Mao, was similarly splendid. I always loved perfectly-cooked rice noodles, and these hit the spot: nice wide rice noodles, somewhat crisped from the stir-frying, and with a rich, bold and flavorful pepper sauce. Good chicken and vegetables on top for a great meal. When I’m craving a good Thai dish, this is exactly the sort of dish I’m craving. So, they aren’t perfect: every time I come to Royal Orchid I’m disappointed by the soup. 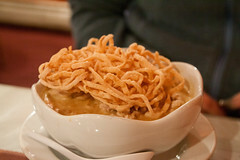 But they routinely deliver on a perfect entree, and aren’t afraid of spice like most Vermont places. I’ll continue to make this a stop when I’m in the area (although Montpelier has a shockingly large number of good food joints).